NETWORK FINALS: FOX’s COLLEGE FOOTBALL game adjusted to 0.9. In addition, NBC’s TROLLS special lost 0.1 in final numbers. CABLE HIGHLIGHTS: ESPN had a pair of COLLEGE FOOTBALL games on Friday cable, led by the primetime Oklahoma vs. West Virginia game at 1.56, with the afternoon UCF vs. South Florida game at 0.45. Hallmark’s movie PRIDE, PREJUDICE & MISTLETOE was at 0.68. 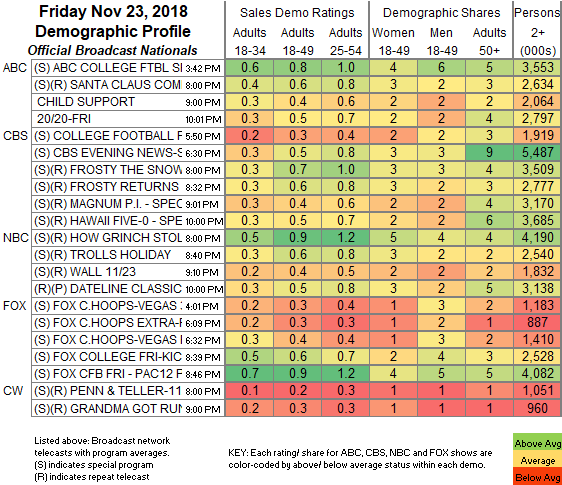 A&E’s LIVE PD dropped 0.13 to 0.57, with the clip show lead-in down 0.05 to 0.32. Discovery’s GOLD RUSH slipped 0.03 to 0.55, with the lead-in hour at 0.22, and lead-out MASTER OF ARMS down 0.06 to 0.20. Fox Sports 1’s Texas vs. Kansas COLLEGE FOOTBALL game was at 0.31, and Oregon vs. Oregon State was at 0.22. Nickelodeon’s LOUD HOUSE was at 0.28. ID’s IN PLAIN SIGHT was at 0.28/0.27, and DEADLY WOMEN was at 0.24. On HGTV, HOUSE HUNTERS ticked up to 0.24, HOUSE HUNTERS INTL gained 0.02 to 0.24, and MY LOTTERY DREAM HOUSE was down 0.05 to 0.23. Food Network’s DINERS, DRIVE-INS & DIVES lost 0.04 to 0.21. On Syfy, Z NATION dropped 0.04 to 0.14, and VAN HELSING was down 0.04 to 0.08. On Bravo, GET A ROOM ticked down to 0.06, and SWEET HOME was down 0.03 to 0.06. 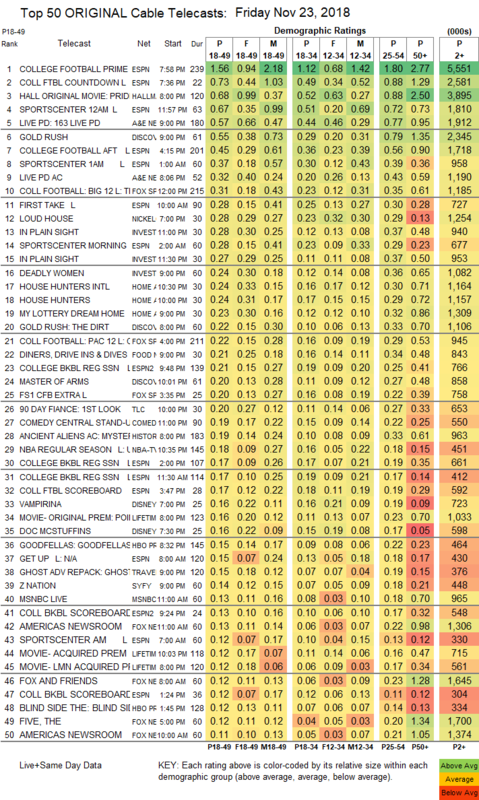 NOTE that we don’t currently have any ratings below the Top 150, including ROOM 104 on HBO.